We woke up to frigid temperatures and plenty of snow. 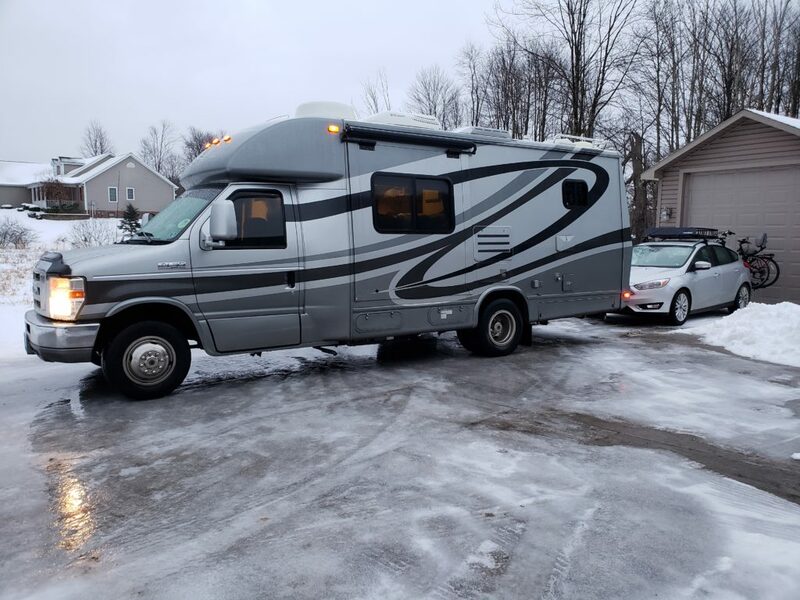 The storm passed and our driveway was plowed so we were able to get the motor home out and hitched. However, the driveway was a sheet of ice and we hung on to one another as we shuffled to the motor home very carefully! Dejavu….this is the same scene that played out as last year’s trip! We headed South on I 79 and drove in the rain for several hours. The rain stopped when we got onto Route 19 in West Virginia. We decided to get gas in Summersville, West Virginia. Route 19 was very bumpy and we hit a couple of very deep potholes. When we pulled in to get gas we realized we had a problem. Turns out our right front passenger tire was flat – totally flat. We had also lost our hubcap. You may remember we lost the same hubcap last year and our friends in Florida found it and we reunited the hubcap with Minnie Pearl in October. We don’t think that we will find this hubcap again 🙁. It turns out that when the hubcap came off the wheel we think it actually bent the valve stem. 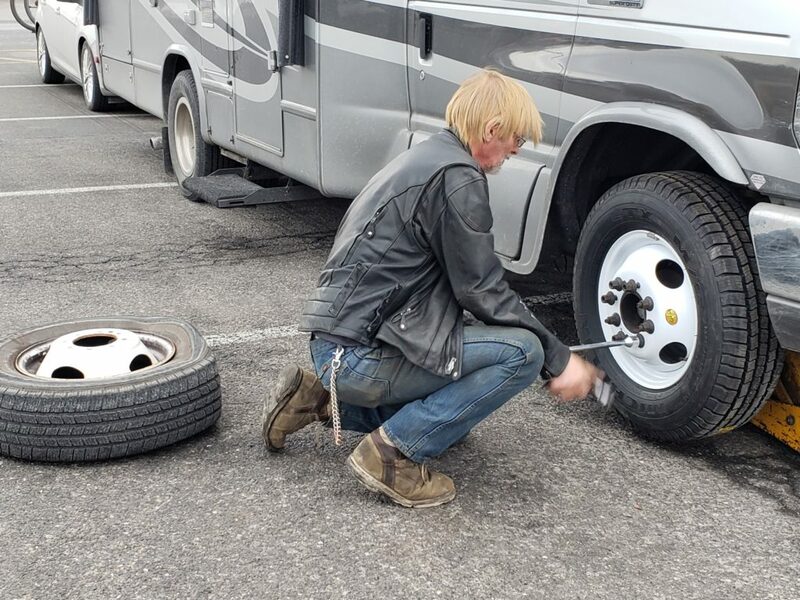 When we tried to pump up the tire all the air was rushing out of a crack in the valve stem. Luckily we were close to a Walmart and we pulled into the parking lot. After checking things out, we called for some help. We called Good Sam roadside assistance and their line was busy, so we called AAA. They said someone would be out within an hour. About half an hour later JJ pulled up and started to go about replacing our flat tire with our spare. This is the same Walmart we camped at Oct 1, 2018!! 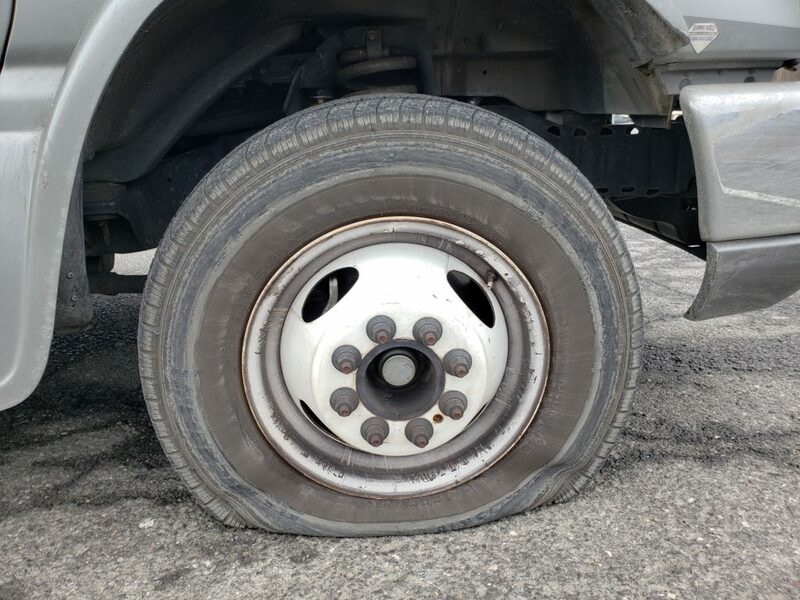 JJ was done very quickly and told us about a place a couple miles down the road that we could get the damaged tire repaired. 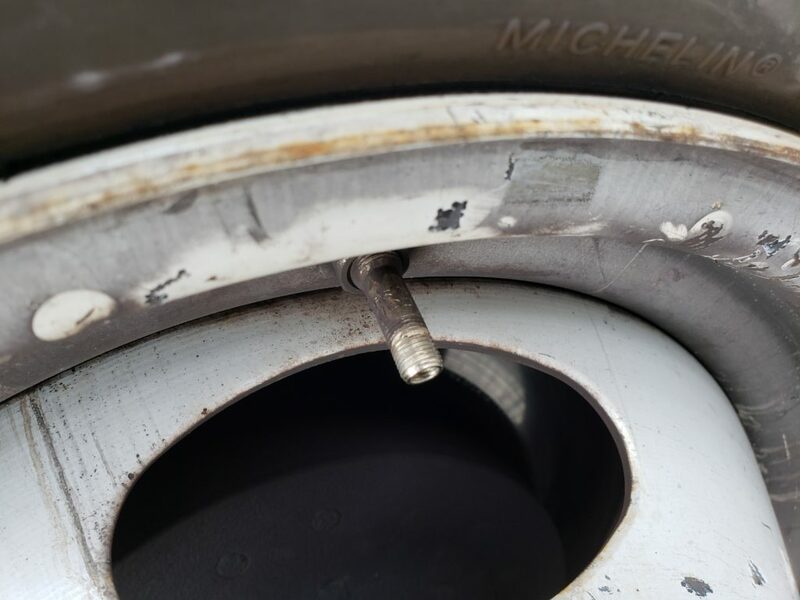 We went there and the guys repaired our tire at no cost and it turned out it was just the damaged valve stem. They put a new high pressure valve stem in. Aren’t people great? We only lost about an hour and a half for our flat tire mishap. That is pretty great. Earlier in the day we had called a campground in Virginia to reserve a site and told them we would be there before 5:00 p.m. Turns out we had to call them back and let them know we wouldn’t be making it by 5! They said no problem – there were lots of sites available – just pick one. We got to the campground just as it was turning dark. The weather felt right balmy at 58ﾟ. Much warmer than the 3ﾟ we had yesterday morning! Next stop – Myrtle Beach where we will be visiting friends for a few days! Okay…here we go again…so interesting to follow your blog…and pictures. Thank you, Gordon. We love having you with us! Can’t wait to see you! You two are the “True Road Warriors” . Starting your journey at the end of January from home should get you a medal! Have a great adventure and be safe on the road. We are hoping to see you down here .. we will keep the jacuzzi hot . Posting my house , I hope you do not mind . Welcome to our blog Lida! 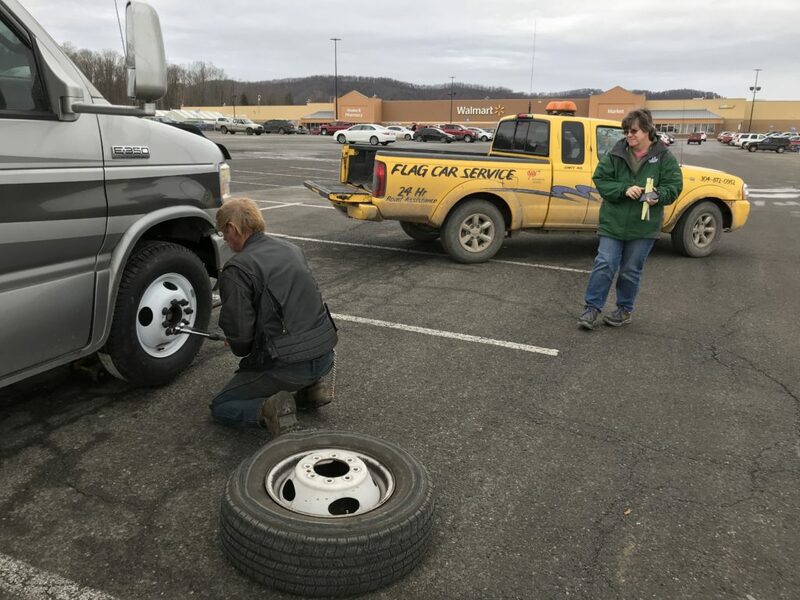 You guys do it right – leaving the cold NW corner of PA much earlier than January! Looking forward to seeing you in sunny FL.